SOLD!! Spotless 4 Bedroom in Woodland Park! You'll love this beautiful and meticulously updated gem in Evergreen Heights! Situated among mature trees and lovely distant views, this home's upgrades emulate better-than-new condition. Pride of ownership abounds with all those special touches that are plain to see (see "Extras") and many that are NOT, such as upgraded carpet padding, new natural gas lines, a new 3/4 hp garbage disposal, treated sub-flooring and so much more. 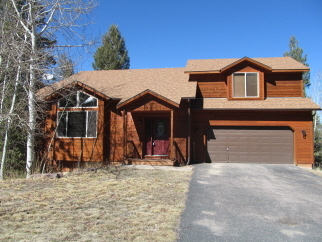 Come see this gorgeous home to find a full list of improvements and discover your dream home! Interior Features Cook for 2 or 20 in the updated kitchen featuring new top-of-the-line stainless steel refrigerator and appliances, oak cabinets and self-closing drawers, new stainless steel sink and faucet, and new high-end counter tops. Other upgrades include porcelain tile in the entry, kitchen, dining room and powder room; tile is set in thin-set mortar to prevent cracking and is sealed; new carpet and paint throughout; brand new hard-wired smoke and carbon monoxide detectors; the basement bedroom is insulated for sound and temperature; there is a gas line for a BBQ beneath the deck; new bathroom vanities with brand new plumbing; new granite counter top in master bath; travertine counterpart counter tops in powder room and basement bath; new front landing; newly stained exterior; new weather stripping and paint on front door... there's even an infused stain-resistant coating on the master shower glass to prevent those difficult to clean hard-water spots! This is a must see... don't miss out!